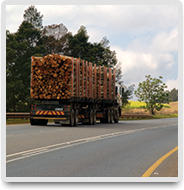 Forestry is an important part of the economy for Sisonke District Municipality.In 2010 the forestry sector contributed over R331 million to the district’s GDP and constituted more than 8% of the district’s economy.In uBuhlebezwe Local Municipality for example, as in most of the district, most of the land is arable for forestry. Moreover, timber producers in the district have indicated that there is still a growing demand for timber to be produced, as the market has not yet reached saturation. 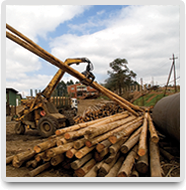 Timber is mainly produced by Sappi, Mondi, Mondi/Shanduka, Mesonite, NTC and some private farmers. Some of the private farmers have their own plant (e.g. 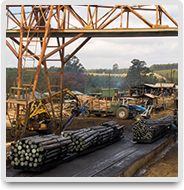 Flaxton) and treat their own timber. 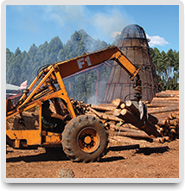 Timber production involves growing eucalyptus, pine and wattle spe- cies,with the eucalyptus species predominating, Timber operations involve silviculture, harvesting, protection, roads and open area management.There are also value-added opportunities in pyro wood, as an alternative low smoke energy source. non-integrated firms from accessing vital inputs. Moreover, the environment cannot support an extensive expansion of existing plantation area- the water and ecology of the district and its municipalities would be severely dam- aged by future extensive forestry plantation and growth. Issues therefore need to be ad- dressed to maximise fibre production and ensure a sustainable supply of raw materials. A major issue here is the increase in fire-related damage and the land restitution process. The major challenge is thus to address the major risk faced by small producers who lack resources and knowledge for fire risk management.